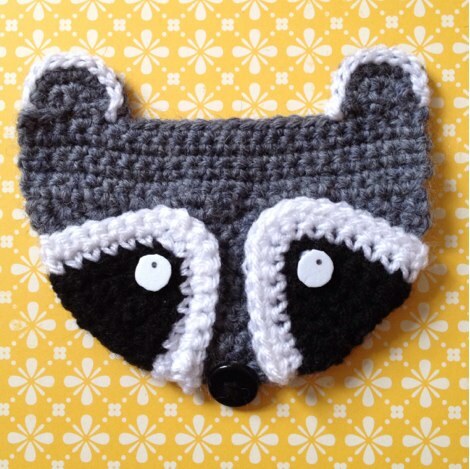 In Issue 10 of Simply Crochet, there’s a foxy purse that I designed on p.85. I love doing fun things like this, and given my poor record at finishing projects, it’s nice to be able to do something that doesn’t take very long! 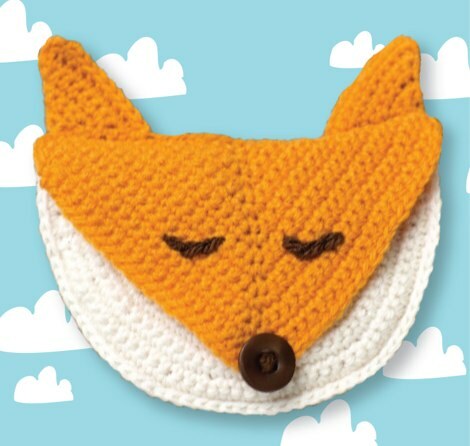 If you’d like to see how to make him, you can buy an issue at My Favourite Magazines – this link is for the subscriptions page, but there is also a link top right of the central column for buying a single issue – or search the digital magazines page for Simply Crochet in your format of choice. With black DK yarn and a 3.5mm (US E/4) hook, ch5. Fasten off, leaving a long tail for sewing, and weave in starting end. For the eyes, you can either embroider a circle using small chain stitches and white yarn with a black French knot in the centre, or use 2 small circles of white felt and a French knot in black. I cheated a bit in the photo because I couldn’t lay my hands on my scraps of white felt, so I used a bit of craft foam and made a dot in pen for the eyes. When you sew the two patches to the flap, turn one over so that they will be symmetrical. With grey DK yarn and a 3.5mm (US E/4) hook, ch2. Fasten off, leaving a long tail, and weave in starting end. Use the long tail to sew each ear to the top of the flap. With white DK yarn, ss around the outside edge of each ear, fasten off and weave in all ends. Sew a black button centre bottom for the nose. That’s him sorted! There may even be a Mr.Hedgehog to bring up the rear. I’ll keep you posted. Next Post Hook a hedgehog! Your pattern is so adorable! It was one of the reasons I just had to buy Crochet magazine. I did have a question about it, though. When I’m stitching the semi-circles, what is the straight edge seems to come out pointy, so that the whole thing looks like a pie slice rather than a semi-circle. What could I be doing wrong? I totally agree with Wocky. I’ve bought the magazine for the same reason, too. It is an amazing pattern! Mr Fox looks very posh!I am currently in the making of it. Will let you know how it turns out. Fingers crossed! All these being said, keep up the good work and keep them coming. We love them all! Thanks for the kind comments Andreea! I agree, it would have made it easier to have more photos on the feature. At the moment, the way this feature is planned means that there isn’t much room for more photos, but I will feed your comments back to the Editor. When I wrote this post I had actually mislaid my sample of Mr.Fox! I couldn’t find him anywhere which was annoying because I wanted to take some of my own photos. I have since found him again, so when I have a spare moment I will consider adding a few more photos here. Thank you for taking my suggestion under consideration. It means a lot. Also, I do hope that the Editor is going to allow you more space in the feature next time. We would love to see more of your creations. I have got great news! Mr. Fox is ready! It is looking fabulous! I did, however, end up using 2 strands of DK yarn, 5 mm crochet hook and doubled the size of everything. The final product measures approx 10 x 7 in. It is more like a medium bag, with lots of room inside. I’ve also added a long, thin handle to it, fully lined it and under the nose I’ve put a tiny piece of velcro as a fastening option. I will make the tiny version, too…to go with it:). If I have got the time next week I might put some pics on my blog and let you know. Really pleased Mr.Fox has turned out so well Andreea. I would love to see some photos if you have them. I noticed someone else on Instagram had done the same thing as you in ‘super sizing’ it to make it into a bag. Great idea! I will have to start a Pinterest board for the foxy pics – will investigate. More photos would certainly help! Mine has come out lozenge-shaped thus far, which is fine, but which doesn’t really match the photo. Still, I think it will be cute. Hi stabberwocky (great name! ), if you think you need help you could send me a pic? I have added a board on Pinterest for makes on my designs, so let me know if you would like to post a pic of yours.